Set Design, and "They're in the Walls!" After five years of Dinovember, one photo book, and two children’s picture books, we’ve taken hundreds of pictures of plastic dinosaurs. If dinosaur photography were a legitimate discipline, we’d be the experts. There are a few ideas we’ve come up with that we’ve never had the chance to photograph but continue to stick with us months, even years later. One idea in particular just wouldn’t let go. 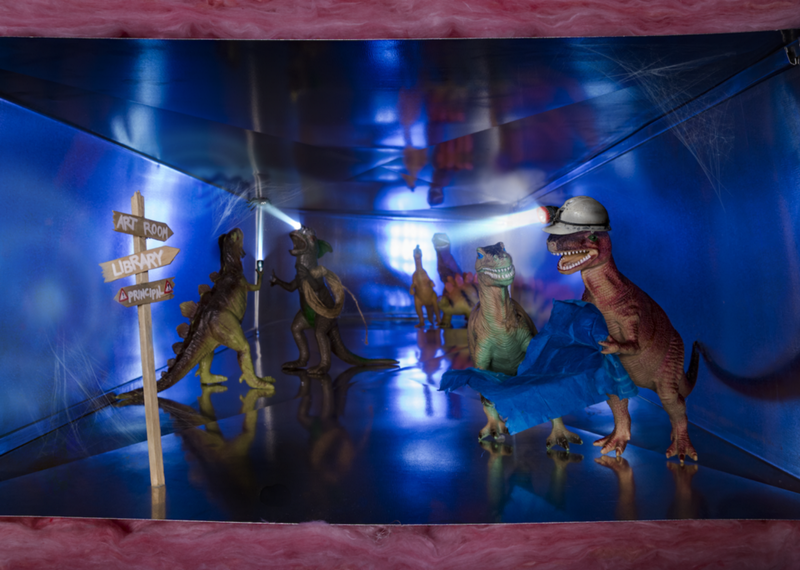 We wanted to shoot the dinosaurs in a ventilation shaft. Maybe in a cross-section of wall, or a looking down from above—the details didn’t matter. It became my white whale. Too intricate (and expensive) to shoot for Dinovember, too far outside the simple narrative of What the Dinosaurs Did Last Night, the idea languished in the ‘someday’ file for more than two years. During a call with our publishing team, our editor Mary-Kate mentioned that she wanted to know how the dinosaurs were sneaking from room to room without staff or students noticing. Susan and I looked at each other and smiled. The time had finally come. We sketched a quick storyboard and sent it over. Mary-Kate loved it, we loved it—it was going in the book. Now we just had to figure out how to pull it off. The size duct we needed wasn’t available at the normal hardware stores. 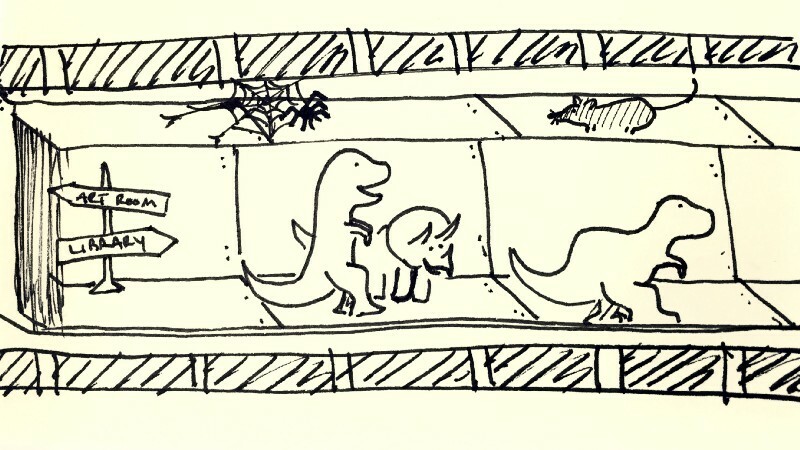 The tallest dinosaur, Rex, is about 10", so the duct would have to be at least a foot tall. That meant we had to find a commercial supplier. We’ve remodeled the kitchen since this was taken and looking back at this photo I want to die a little. We ended up with a 12"x24" duct, about 6' in length, with an elbow curve for depth. It took up the entire kitchen. It became clear early on that we wouldn’t be able to achieve the cross section effect we originally envisioned, but there was a happy holdover— bright pink insulation gave the set a pop of color. To light the inside of the duct, we cut fan blades out of a piece of cardboard to use as a flag for that classic Die Hard look. A soft light at the front opening highlighted the dinosaurs and their props. Traditional illustrators have much more control over the details of their art; colors, proportions, scenery, light. We can’t even change our dinosaurs’ facial expressions! We only have what we can physically create in time and space. Sometimes, this means relying on post-production. In the ventilation shaft scene, the metal was highly reflective. The colorful dinosaurs cast red, purple, and green across the walls and ceiling. It distracted from the action of the scene. The silver also came out looking very washed out, especially next to the pink insulation. It was so…utilitarian. So unillustrated. We erased the reflections (leaving a few that we felt helped keep the set feeling real) and bumped the blues. We also enhanced some of the shadows and messed with a few other things. It ended up being one of our most time-consuming spreads, but we were too thrilled with the results to care. It’s a great feeling, after all these years, to take a picture that makes it all feel new again. We only hope the kids who read our book enjoy looking at this scene as much as we enjoyed making it. What the Dinosaurs Did At School is available anywhere books are sold. I often imagine traditional illustrators at work. Desks littered with sketchpads and pigment markers and little jars of India ink, their latest work taped to the light box, crumpled paper in a halo around the wastebasket. Spreads begin as thumbnails, thumbnails become sketches, sketches are traced and redrawn. It’s iterative, solitary. What we do is nothing like that. The art in our books is photographed. The What the Dinosaurs Did series features real subjects, real props, and real locations. Movement and action rely (almost) entirely on practical, in-camera effects. That was challenging enough when the stories we were telling took place in our home. 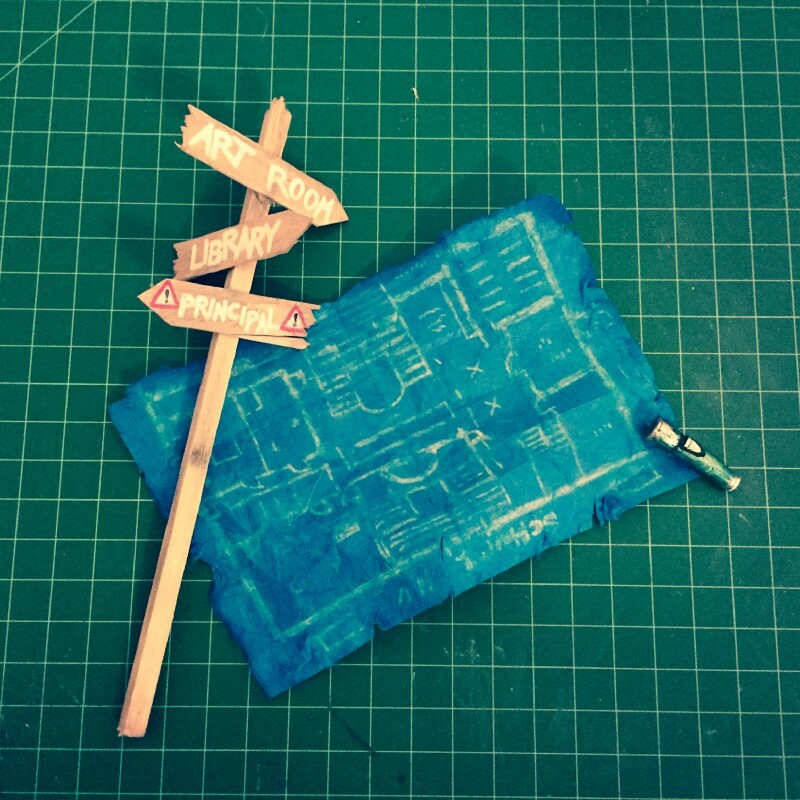 For our latest entry, What the Dinosaurs Did at School, we took our act on the road. To communicate our vision to our editor. That seat-of-the-pants approach has, on occasion, come back to haunt us. What the Dinosaurs Did at School out now! After conquering your home in What the Dinosaurs Did Last Night, the dinosaurs set out in search of a new adventure. They've stowed away in your backpack and followed you to school! Can you catch them before the teacher locks them in the DRAWER OF NO RETURN?